We couldn’t be happier that the video doorbell category is blowing up right now. These devices are so easy to install, and they add an extra layer of security that serves as a deterrent. They’re also just plain cool, letting you instantly see who’s at your door whether you’re in a room upstairs or halfway around the world. If you haven’t already installed a video doorbell at your home, you’re in luck. Why? 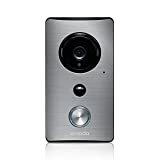 Because Amazon’s best-seller, the Zmodo DING WiFi Video Doorbell, is on sale for just $60 right now. It’s just as good as Ring’s $200 model, plus it includes six months of free cloud storage. Answer the door wherever you are – see and speak to visitors directly from your smartphone or web using On-Demand video, meaning that you can view live video of your front porch at any time, even if no one rings the bell. A new HD wide-angle lens gives you a clear view of your entire space. Slide your finger over the live view screen to pan the video feed left or right. There is now an improved two-way audio that allows both parties (door end and smartphone end) to speak simultaneously. Zmodo Beam extends your WiFi range and reduce dead spots. It also acts as a smart home hub and can connect Zmodo accessories, such as door and window sensors, which alert you on your phone whenever a sensor is triggered.